It seems like a lot of changes have been going on in the cosmos. First, Astronomers talked about Pluto, the planet that was suddenly not a planet. The next discovery came in the form of an announcement that a “new” Zodiac symbol had been discovered. This new Zodiac symbol was believed to have thrown the entire system on its head. Or did it? The announcements surrounding this symbol, Ophiuchus, have sent many people running to figure out what their new symbol was, and lamenting that their birth date no longer falls under the symbol they have lived with all of their lives. What many people do not realize is that Ophiuchus is far from being a “new” Zodiac symbol. It was actually listed by Ptolemy, a famous second century astronomer. It was a part of the sidereal astrological system that is used by Jyotish or Hindu and Indian astrologers. It is not a common part of the system normally used by Western astrologers. While Ptolemy identified 48 different constellations, there are actually 88 modern constellations that are visible in the sky. 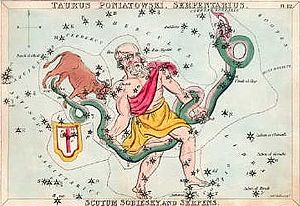 The name Ophiuchus actually means “serpent bearer” in Greek. 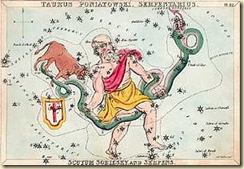 This translates to the word Serpentarius in Latin, and this is a former name for this constellation. The image that is connected with this constellation is of a man grasping a snake. This snake is represented by the constellation Serpens. 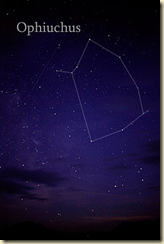 Each of the Zodiac constellations has a story or symbol that goes along with it. The Gemini twins are Castor and Pollux, Sagittarius is believed to represent the centaur Chiron and Taurus represents the bull form that Zeus took when he seduced Europa. Each of the symbols has their own link to Greek mythological figures. The symbol Ophiuchus was believed to represent Asclepius, a healer who was killed by Zeus when he discovered the secret of immortality. Another theory is that the symbol represents a Trojan priest named Laocoon. Laocoon warned the Trojans to refuse the Greeks’ gift of the Trojan horse that ultimately led to their downfall. It was believed that the gods sent a pair of sea serpents to kill Laocoon. 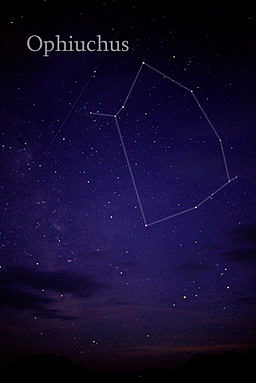 It is believed that the Babylonians knew about this constellation as well but that they followed it in the form of the constellation known as the Sitting Gods. Still other possibilities for Ophiuchus include Apollo wrestling with a python, and Phorbas. Phorbas was a Thessalonian who was able to rescue people living on the island of Rhodes. It was believed that he was placed in the sky after he saved the people of Rhodes from a plague of snakes. This is why this constellation is in the shape of a human grasping a snake. There are several significant stars in this constellation. One is Barnard’s Star. This is one of the stars which lie closest to our own Solar System. The star that gave rise to Keppler’s supernova was also part of this constellation prior to it going supernova in 1604. Other celestial discoveries surrounding this constellation include a cavity in the solar system known as a super bubble, the discovery of several star clusters, a nebula, and the presence of a planet that orbits in the constellation. Studies have shown that this planet may possess large quantities of water, a trait that can be seen by this planet’s low density.